Be prepared for one of the most amazing Bird Watching Trips possible in Panama. Our small group birding trip will take you to the most remote reaches of Panama to search for the ever elusive Harpy Eagle and the many endemic species of the Darien Jungle. You will enjoy Panama’s best bird watching. After you will spend your time bird watching and enjoying the incredible history of the Panama Canal. ✓ Private meet and greet at the Tocumen Panama International Airport. ✓Services of your private naturalist guide, Rudy Zamora (35+ years of birding in Central America) 24/7 in-country assistance. Your guide, Rudy will meet you at the Tocumen Airport. Your private transfer will take you 40 Minutes to downtown Panama City and the Hotel Bristol. Check-in and relax. The group meets in the Salsipuedes Restaurant on site, for your welcome dinner. Enjoy an early morning breakfast and departure for the Darien Jungle. you will make several stops along the way for birding, plus a lunch stop at a typical Panamanian restaurant. you will arrive late afternoon at one of the most remote places in the Americas; The Darien Jungle. Canopy Camp is in the Darien province, a place revered for it is incredible wildlife. Your adventure today will depend on the advice of our local guide from the tent camp. You may embark on the Harpy Eagle Tour, the El Salto Road, Filo del Tallo Hydrological Reserve, or Tierra Nueva. All the spots feature endemic species and provide for an amazing day of bird watching. This morning you will depart the tent camp after breakfast. You will stop at the San Francisco reserve for a last chance to pick up some of the areas most elusive species. 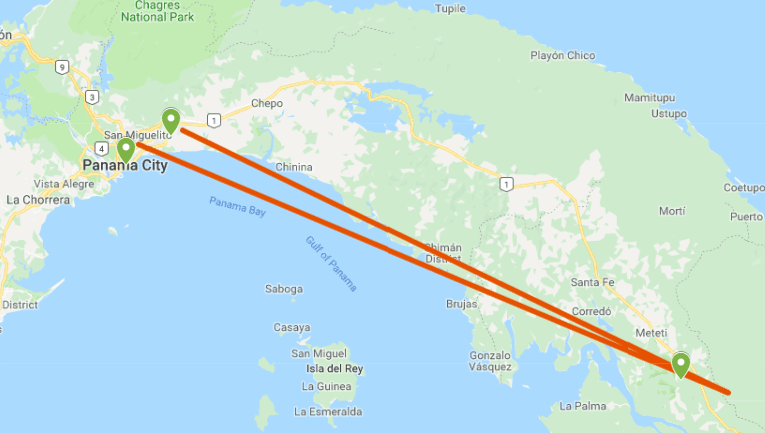 You will make a stop along the way for a typical lunch and then make your way back to Panama City (with birding stops of course) and check in at the Hotel Bristol. If you are not too tired from the trip back to Panama City, enjoy an optional excursion to Casco Antiguo, the old town of Panama City. Your group will go together by taxi (just 15 minutes away). The town is alive with restaurants, cafes, live music, and rooftop bars. Enjoy breakfast at the Bristol and then depart for Soberania National Park, the Discovery Center and the Discovery tower. These areas are three of the best in Panama. it is hard to imagine how great the birding is, so close to the city. you will walk the trails, visit the center and climb the tower for an incredible treetop view of the canopy. you will need to be quick with your binoculars to catch all the species in this area. After birding all morning, you will take a break for a delicious picnic lunch, and then head to the Miraflores locks for a taste of Panama history. The Miraflores museum provides a fascinating insight into the history of the Panama Canal. Be sure to spend some time on the viewing deck, watching ships pass through the canal. At the conclusion of your visit, you will return to the hotel Bristol for an evening at leisure. This morning you will enjoy breakfast at the Bristol, and wait for confirmation on the time for your Half-day transit of the Panama Canal. Visitors need to get the okay from the Panama Canal Commission, the organization that controls all transits of the canal. You may visit in the morning or the afternoon. you will return from your ½ day transit tour for your final night in Panama City. Relax and enjoy the Bristol, or explore Casco Antiguo. This morning you will have breakfast at The Bristol and then depart for the Tocumen Airport and your flight home.